LAST MONTH, we looked at ultra-thin cuts on object balls in order to send the cue ball to the other side of the table, presumably in a spot where your opponent would be in some trouble. This month, I want to stick to safety play by discussing a trick that I teach my students. Sometimes, when an amateur-level player is faced with a defensive shot, she can get wrapped up in trying to pinpoint the exact spots where the cue ball and object balls will stop. But in 95 percent of the shots you'll face, you can play a perfectly effective safety by focusing on the speed of just one ball. For example, imagine you are looking at the table shown in Diagram 1. The 7 ball is blocked from going into either corner pocket, so you'll be best served looking to play defensively. The key here is to hit the 7 so it bounces off the bottom rail and hides behind the 9 ball. The cue ball will go toward the foot rail and then head back up-table. I've seen so many players misplay this type of shot, because they're too determined to freeze the cue ball to the head rail. If you focus on the speed of the cue ball, you may end up over-hitting the 7, which can leak out from behind the 9 and sit in front of the top corner pocket. It doesn't matter if the cue ball stops a diamond short or long, because the 8 and 9 balls will still be blocking a clear path. 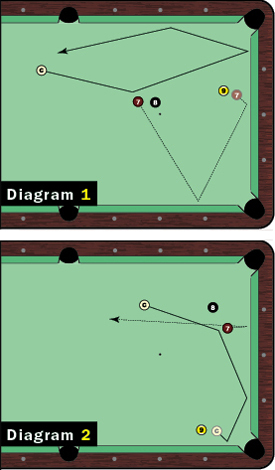 On the flip side, the example in Diagram 2 shows a case where the speed of the cue ball is the most important factor. You want to drop the cue ball behind the 9 ball, knowing the 7 will be rolling down to the other side of the table. As long as the cue ball is behind the 9, the 7 ball can be just about anywhere on the other half of the table. Every situation is different, but you should be able to pick the right ball that you need to control. This little trick will simplify your safety play by limiting your focus to one ball.